We love the funky pattern adapted from a traditional skull and crossbone design. 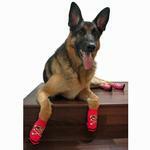 The Pirate Girl PAWks Dog Socks are pink and black and feature an anti-slip paw print on the bottom. Your girly dog will love the new-found traction they have on slippery surfaces with these original and functional dog socks. Posted On 01/28/17 by Alexandra C from Seattle, WA Yes, Alexandra C recommends this product! These socks are fun, fashionable, and functional. Great for older dogs who might have problems walking on smooth floors. Posted On 11/07/15 by Heidi J from Ridgeland, WI Yes, Heidi J recommends this product! Posted On 08/10/15 by Jody S from , PA Yes, Jody S recommends this product! Awesome! Look great on my 14 year old Golden Retriever. Wanted something so that if her allergies kicked in and she started licking her feet, I could cover them. They work. Easy to put on and keep her from slipping on the tile floor. Posted On 10/16/14 by Sybil B from , WI Yes, Sybil B recommends this product! Well made but I ordered the wrong size.